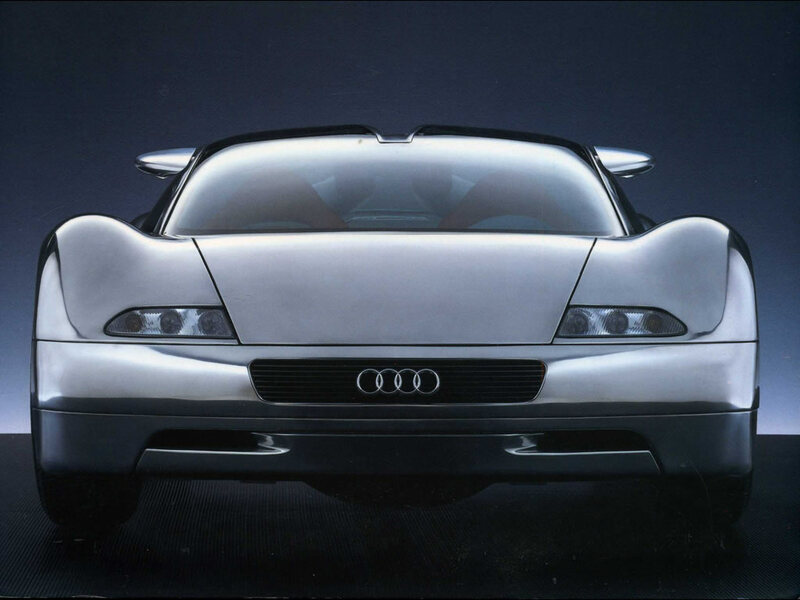 The AUDI AVUS Quattro was introduced at the 1991 Tokyo Motor Show and defined as a futuristic sports car study in Aluminum. The AVUS race track in Berlin, past symbol of the ultimate in racing, records and performance, was Audi's inspiration for the AVUS Quattro, a concept of what will be possible tomorrow. Audi in the presentation insisted that this is not a fantasy car, but an in the metal combination of ideas sufficient to wake the imagination. A work of art on oversize wheels under a sleek skin of aluminum. A real machine with safety reserves far superior to those of any ordinary dream car. The flowing lines of its highly polished aluminum body reveal the origins of the AVUS quattro; the record breaking Auto Union cars. A clear similarity, even though the interpretation is new, with very short overhangs and modern engineering. The body of the car sweeps down between the oversized wheels, flat and streamlined, as if ready to surge away from the starting grid. The cockpit is well forward, and the 12 cylinder power unit is behind the seats and in front of the rear wheels. The classic sports car concept from the Audi designers is clearly defined by its external dimensions: with an overall length of 442 cm the wheelbase measures a full 280 cm. 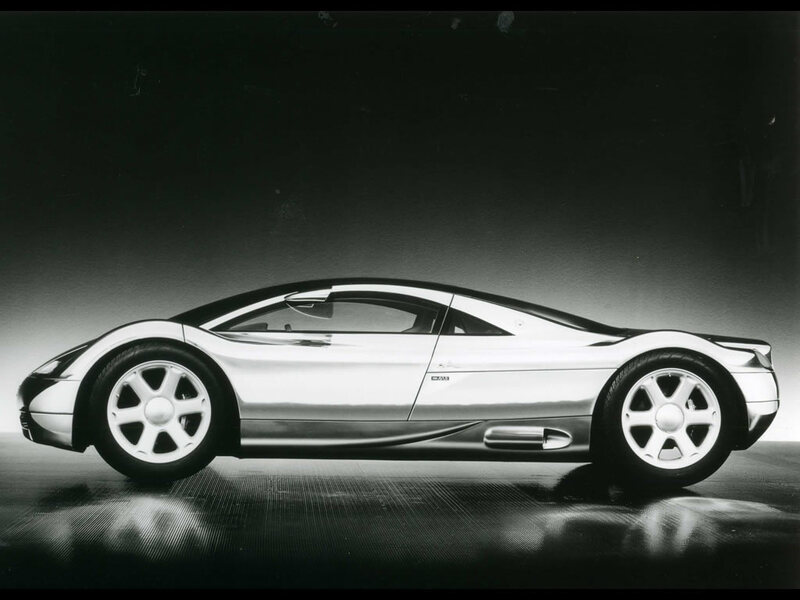 The Audi AVUS Quattro is only 117 cm high, but 198 cm wide. The power source of the Audi AVUS quattro is always in view even with the engine hatch in place. transparent, glass like material shields it from the outside, but the compact 12 cylinder with its three banks of four cylinders is too striking in appearance to hide behind ordinary metal. The power unit breathes through a generously sized air duct designed into the roof structure. 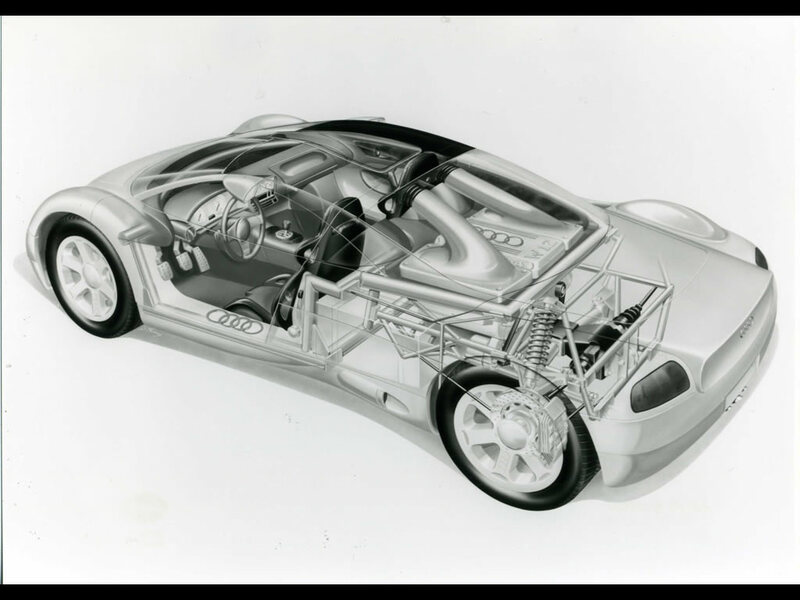 The Audi AVUS Quattro is built around a tubular aluminum space frame weighing only 52 kg. The bodywork, which is bolted to the frame and thus has stress bearing function, weight around 100 kg. The tubular frame is divided into two parts. If necessary the mountings can be detached so that part of the frame, complete with the entire engine block and rear suspension, can be taken out of the car. The space frame, with its cage like structure, contributes the necessary strength and crash safety. The aluminum skin has been hand beaten piece by piece using traditional craftmenship. The number of hammer blows required to beat the aluminum panels into the desired shape is estimated into the millions. Of course, the hammering itself has left no traces. The highly polished, unpainted aluminum body has a perfect mirror finish. Under the bodywork of this two seats sports car prototype is the ultimate in modern technology, an extremely compact and powerful 12 cylinder engine. The power unit develops 509 hp at 5.800 rpm ( max torque 540 Nm at 4.000 rpm) from a capacity of six litres (5.998 cc.). It has no less than 60 valves, 5 per cylinder, 3 for the induction stroke and 2 for the exhaust. There are various different configurations for a 12 cylinder engine. The Audi engineers opted for a W12 concept. Two banks of cylinders are arranged at an angle of 120°, and the third bank is positioned upright in the center, between the two other banks. This configuration produces a highly compact power unit, not much longer than a conventional 4 cylinder engine. The crankcase, the three cylinder heads and the oil pan are made of aluminum. The crankshaft is made of steel and have five main bearings and four connecting rod journals with three connecting rods on each journal. Two chain driven compensating shafts are provided to balance the second order inertia forces. Each cylinder bank has two camshafts. The exhaust side camshafts are driven by a maintenance free duplex chain. The admission side camshafts are chain driven from their corresponding exhaust side camshaft. The engine management system consists of a fully electronic injection unit with cylinder selective knock control, including an ignition system with twelve single ended coils built into the cylinder heads. The sophisticated emission control system consists of two electrically heated catalytic converters, three heated lambda probes, exhaust gas recirculation and additional air injection. By blowing extra air into the outlet tracts during the warm up phase, the unburnt hydrocarbons and the carbon monoxide are after burnt directly in the exhaust valves. This reduces emission and warm up the catalytic converters more quickly. 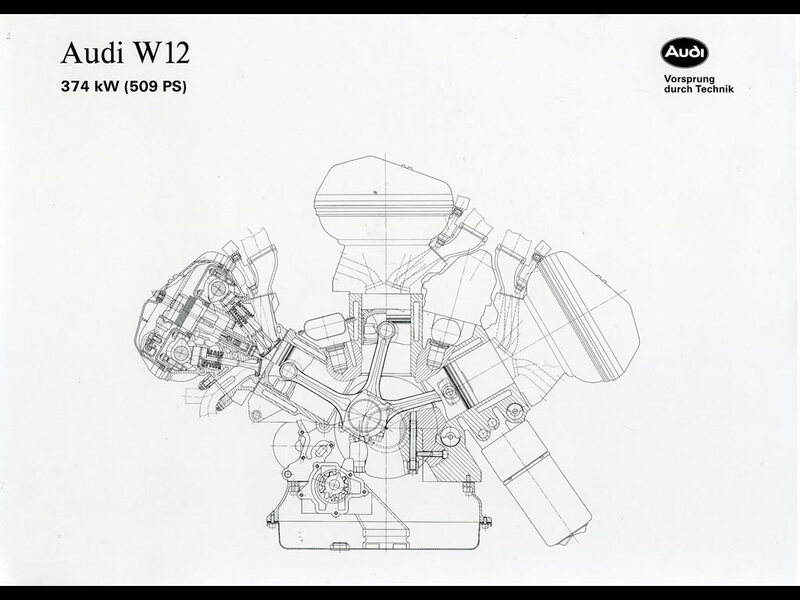 The W12 is located in the middle of the car, and the manual gearbox is positioned between the front wheels; the gearbox assembly incorporates and electronically controlled front locking differential and the Torsen (torque sensing) center differential. The engine and gearbox are joined by a rigid central tub, containing a shaft that transmits the engine power to the six speed gearbox. A multi piece propeller shaft is routed from the gearbox underneath the engine to the rear axle, where the drive power is distributed variably to the wheels by a second Torsen differential. The front and rear suspension set ups are of double wishbone concept and have been tried and tested by actual racing use, including the IMSA GTO and German Touring Car Championship. The rear wheels of the AVUS quattro also helps to guide the car. The Audi AVUS quattro is equipped with an active rear wheel steering system. This rear wheel steering system is electronically and hydraulically controlled, with the car speed as one of its governing parameters. Access to the cabin is provided by two hydraulically assisted swiveling doors. This 1250 kg sports car prototype will accelerate from 0 to 100 kph in 3 seconds and the claimed top speed is 340 kph.